1 1/8" x 4 9/32"
Kawasaki Vertical Engines: World-renowned engineering helps ensure that Kawasaki Engines deliver unmatched power and durability, and most important, reliability. It's why Kawasaki Engines have a better reputation than any competitor. 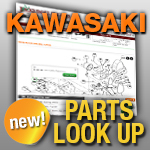 See more information on Kawasaki's Engine Warranty. Shaft Size 25mm x 3 5/32"
Shaft Size 1-1/8" x 3.94"
Shaft Size 1" x 3 5/32"
Shaft Size 1-1/8" x 4-9/32"
Shaft Size 1 x 3-5/32"